I’ve teamed up with Hamilton Beach to bring you this delicious post! Last week I found an incredible deal on fresh cranberries at a roadside produce stand: 2-pound bags for $2. Our family are all avid smoothie drinkers and being the berry-maniacs we are, I grabbed 15 bags. I schlepped them home and threw them in the chest freezer and we’ve been enjoying our daily smoothies with those wonderfully healthy, nutrient-dense cranberries ever since. 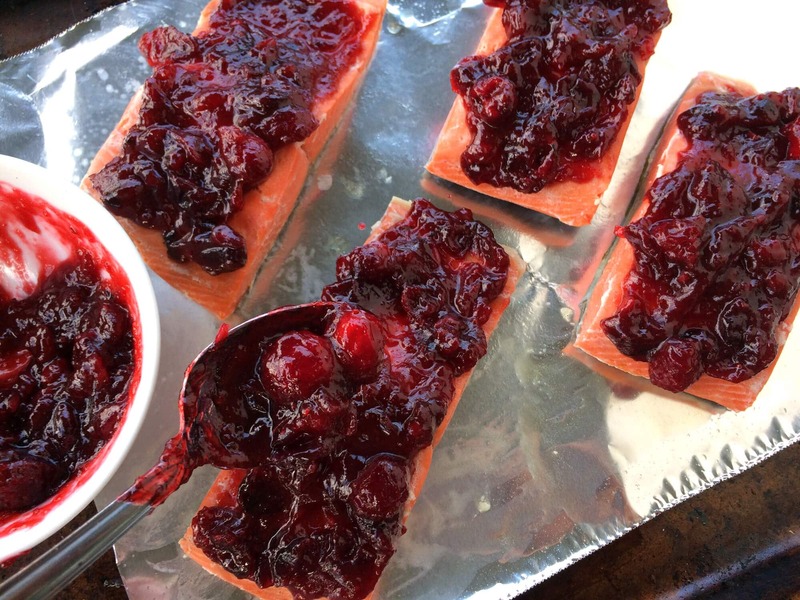 With 30 pounds of cranberries I’ve also been going to work creating some cranberry-themed dishes and making my own cranberry sauces and relishes for canning. Here’s one example, a dish I made for dinner last night and you’re going to love how fantastically easy and delicious it is! I used my latest kitchen appliance to cook the salmon, the new Hamilton Beach Professional Sous Vide and 6 Qt. Slow Cooker, and was very happy with the results. It’s a 2-in-1 appliance, giving you two of the most convenient cooking methods in one compact countertop appliance. Most of you are already familiar with a slow cooker: Place the ingredients in the slow cooker, program the cooking time and temperature, and then go about your day as usual. When the program ends, the slow cooker will automatically switch to warm. When you come back home you’ll have a ready-made meal waiting for you. And cleanup is a breeze. How many of you have worked with a sous vide water oven? Sous vide is a cooking technique that literally means “under vacuum”. Its hallmark is precisely cooked food and is what what many professional chefs rely on, including upscale restaurants. Up until recently sous vide water ovens were only available for commercial kitchens – now they’re available for the home cook. Sous vide involves placing the food in an airtight bag and submerging it under water in a precise temperature-controlled water bath. The food is cooked evenly throughout, reducing the risk of over- and under-cooking and the result is incredibly tender and moist food. 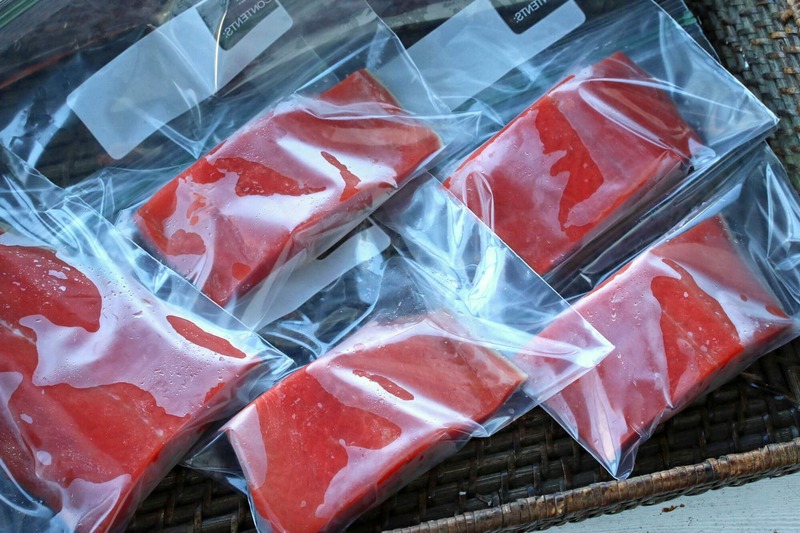 The sous vide method is the perfect way to achieve the best steaks. Cook them so they’re tender, moist and pink inside, then remove them from the bags and finish them off with a quick high-heat searing. Exceptional for cooking meats and fish, the sous vide is also great for eggs, fruits, vegetables, and even desserts. Sous vide water bath temperature can be set from 104°F to 210°F (40°C to 99°C) and can be programmed to cook between one and 72 hours. Combine that with a glass lid for easy viewing, large handles for easy carrying, a sous vide rack to keep the food from touching each other, programming controls with LED indicator lights, a classic stainless steel interior and a 5-year limited warranty, the Hamilton Beach Professional Sous Vide and 6 Qt. 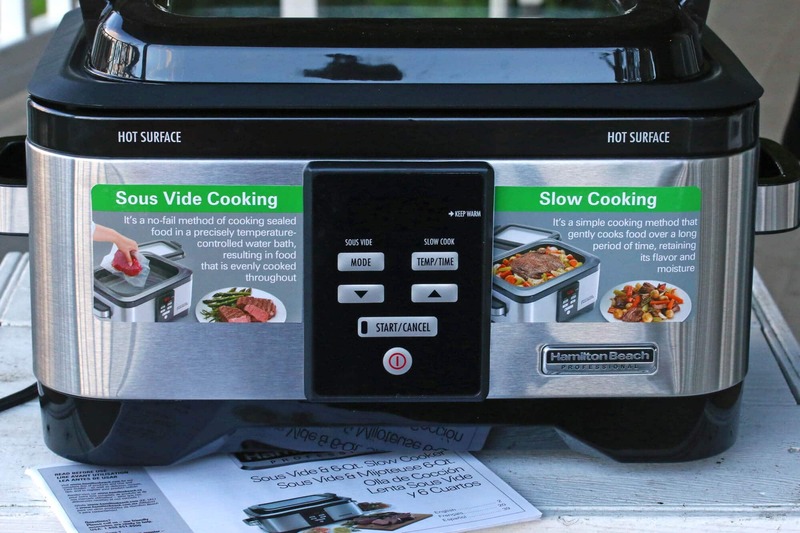 Slow Cooker is an awesome countertop appliance makes cooking both convenient and enjoyable. I love the 2-in-1 feature because I can use both the slow cooker and sous vide methods without having to have two separate appliances taking up space. 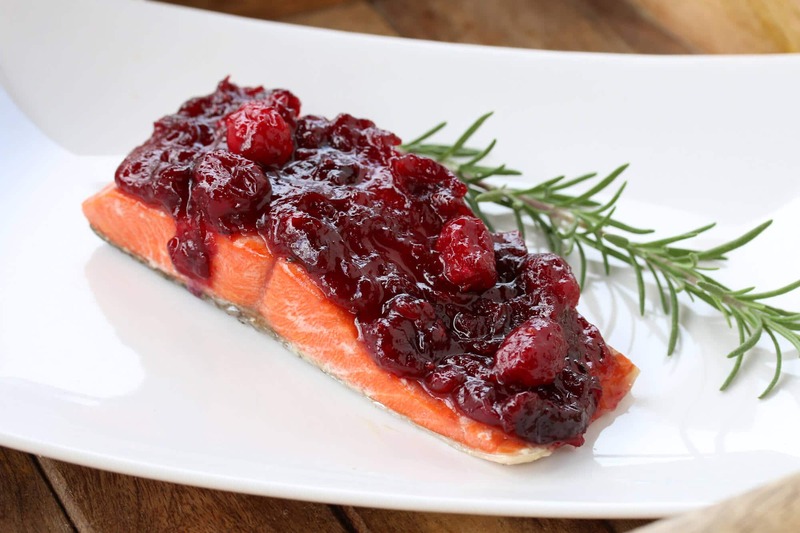 I’m going to make today’s Salmon with Cranberry Ginger Mustard Sauce using the sous vide method for an ultra tender, moist and delicate salmon. You can also bake the salmon, grill, or pan-fry it, whichever you prefer. See the alternative instructions in the recipe box at the bottom of the post. 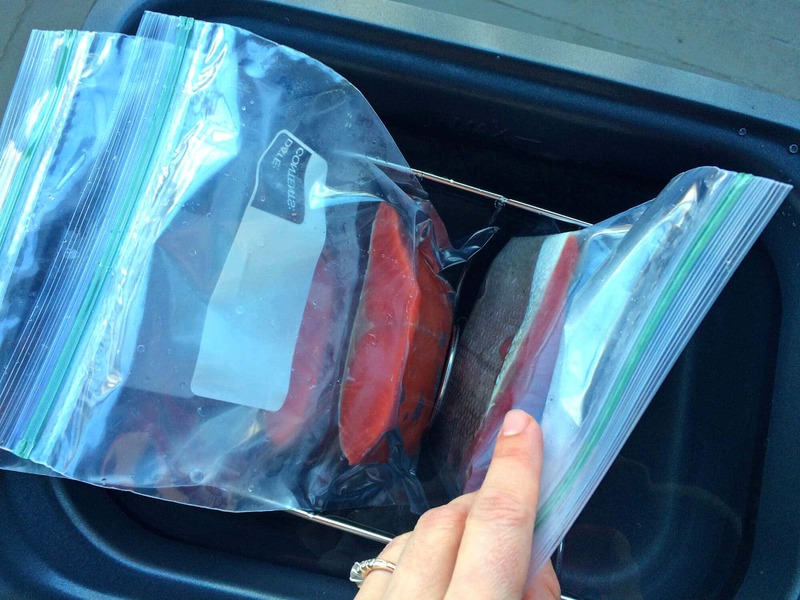 Place the salmon filets in heat-safe, BPA-free and PVC-free resealable bags (read more about it HERE). 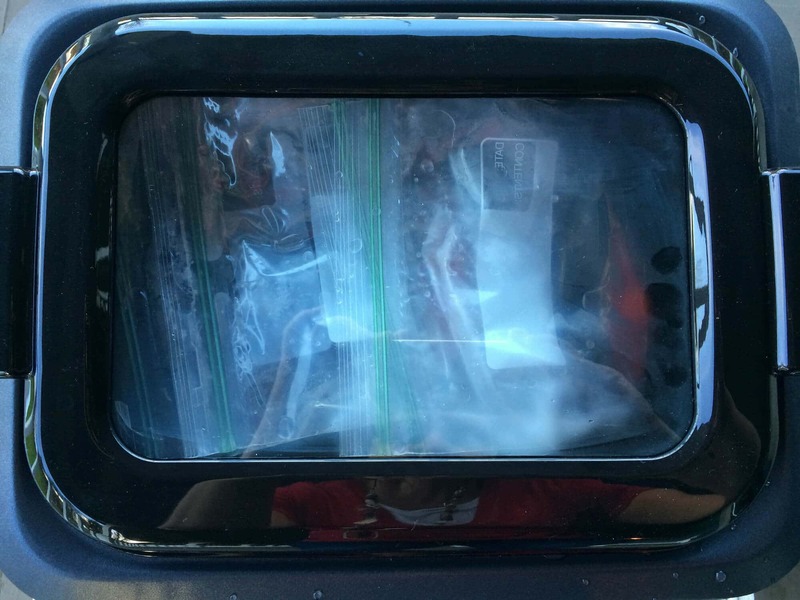 Press as much of the air out of the bags as you can and seal them tightly shut. 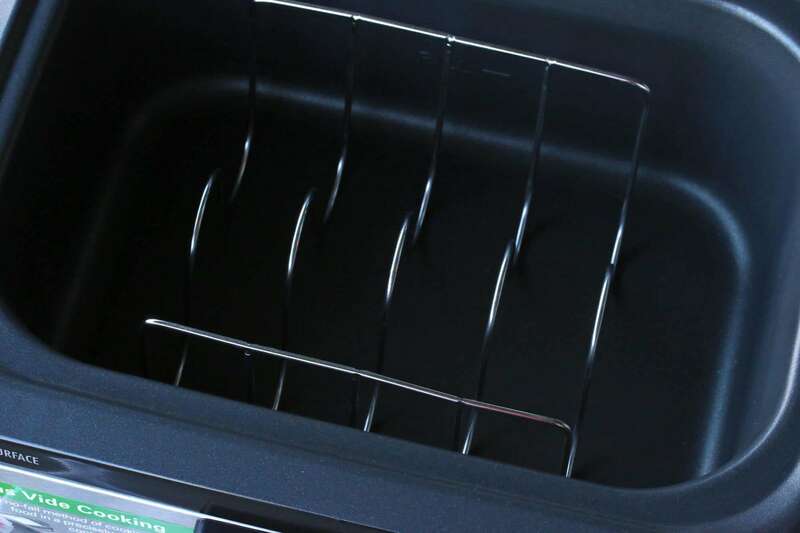 The sous vide cooker comes with a rack so you can place multiple bags in it without the food touching each other. We’re going to fill the sous vide water bath with water, bring it up to temperature, set the timer, and then place each bag in the slots. Then close the lid and go about your business. The sous vide cooker will beep when it’s done. I programmed the cooker for 122 degrees F for 30 minutes for a perfectly moist, tender and flaky salmon. Now it’s time to glaze the salmon filets. Place the filets on a lightly greased cookie sheet. 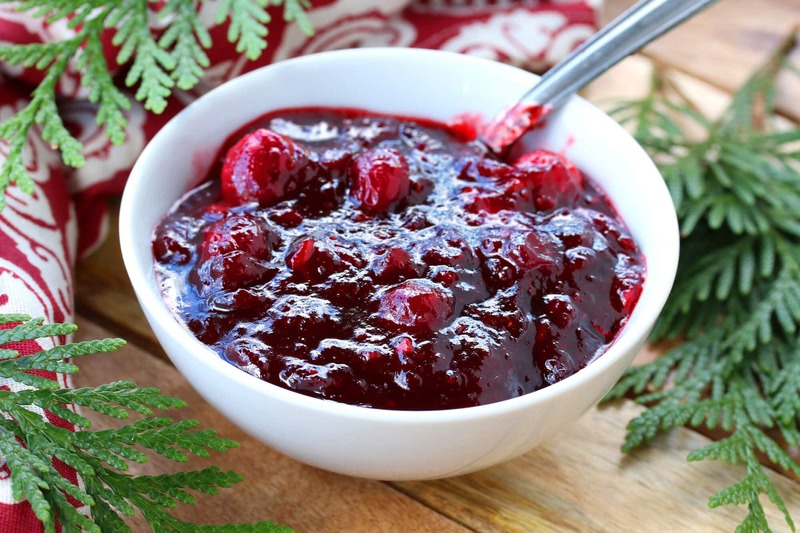 We’re going to use this delicious Cranberry Ginger Mustard Sauce, you can find the recipe HERE. Generously spoon the sauce over each filet. Broil the filets in a preheated oven for about a minute. Don’t over-broil it or it will dry out salmon. Serve the salmon with steamed jasmine, basmati or wild rice and your choice of vegetables. Serve the salmon immediately with steamed rice and your choice of veggies. *To prepare using the sous vide method, see the instructions in this blog post and follow the instructions of your particular sous vide water oven. 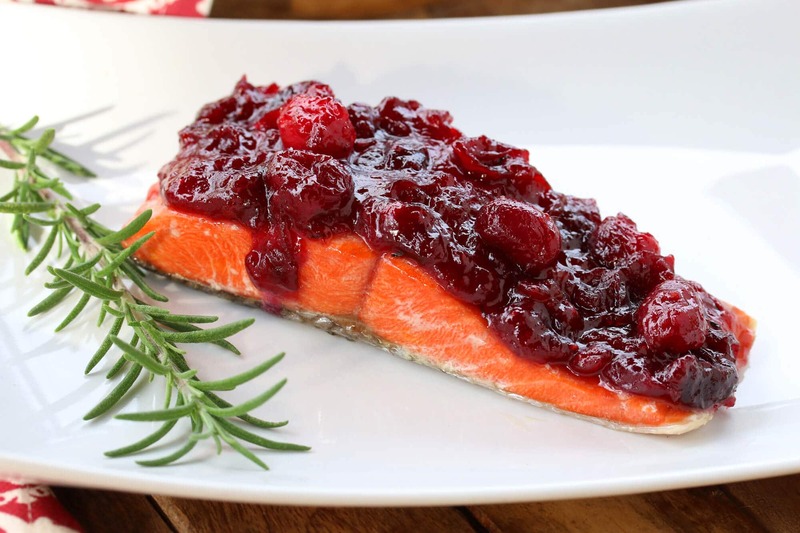 Once cooked, place the salmon on a lightly greased baking sheet and top with the cranberry sauce. Broil for about 1 minute and serve immediately. *To bake the salmon: Preheat the oven to 450 degrees F. Place salmon in a baking dish and baked until cooked through, 12-15 minutes. Top with the cranberry sauce and broil for about a minute and serve immediately. *To pan-fry the salmon: Bring the salmon to room temperature before cooking. Heat 2 tablespoons of oil in a large non-stick skillet over medium-high heat. Place the salmon skin-side up in the skillet and fry for 4 minutes. Turn the salmon over and fry for another 3 minutes, depending on the thickness of the salmon. Cook until the salmon is firm to the touch. 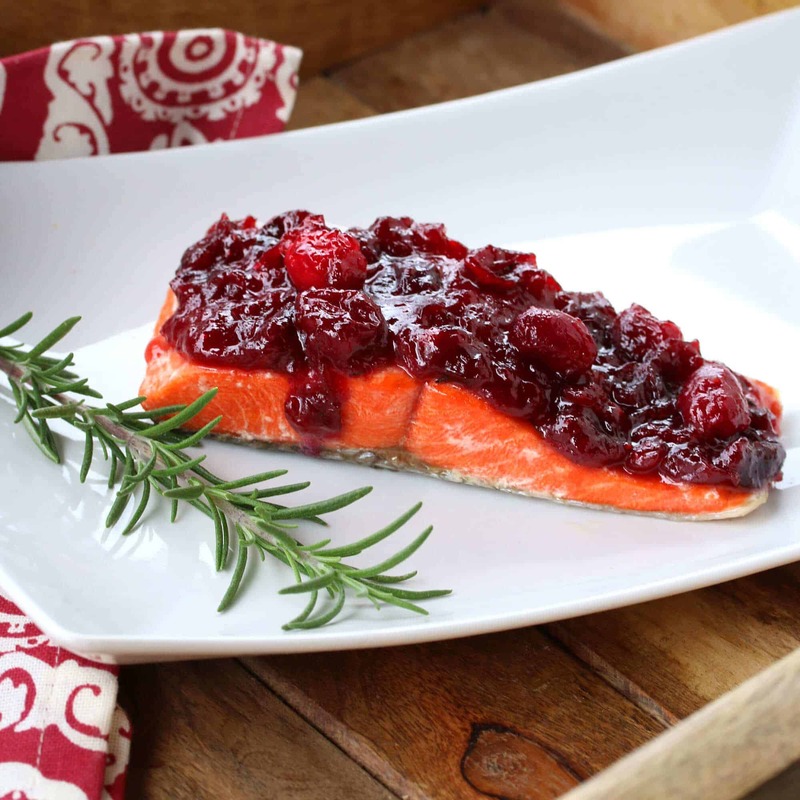 Top with the cranberry sauce and broil in the oven for about a minute and serve immediately. *To grill the salmon: Preheat the grill for medium heat. Lightly oil grill grate and place the salmon on the grates skin-side up. Grill for about 4 minutes, turn the salmon over and grill for another 4-6 minutes or until just cooked through. 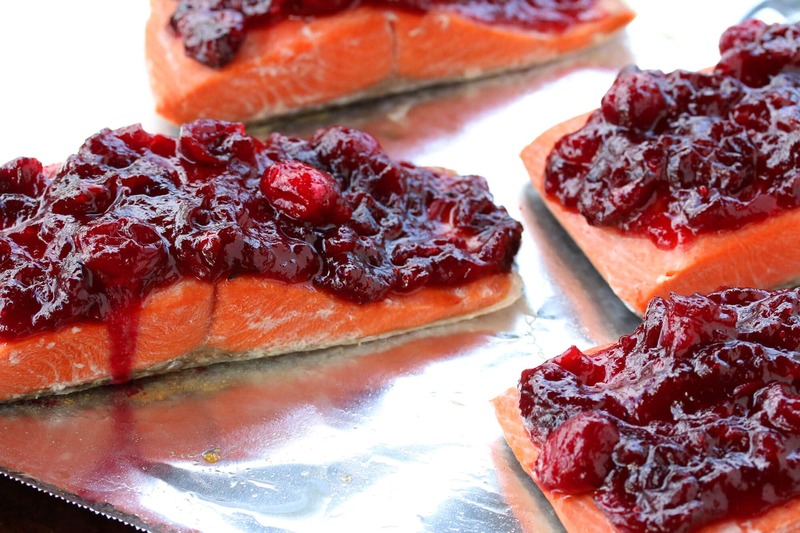 During the last couple of minutes of grilling, top the salmon with the cranberry sauce. Serve immediately. For serving: Serve the salmon with steamed jasmine, basmati or wild rice and your choice of vegetables. Disclosure: I’ve teamed up with Hamilton Beach to bring you this post. Thank you to my readers for supporting the brands that help make The Daring Gourmet possible! my sister loves cooking so i’d definitely give this to her! That’s a beautiful machine…I can only imagine how I would use it. That is such a neat appliance and that Cranberry sauce sounds so yummy! I have never used a sous vide, so I am not sure how I would use that. But we use our slow cooker for cooking many of our roasts and chickens. I’d love to be able to sous vide a chicken breast so that it stays moist but perfectly cooked. That’s a beautiful machine. 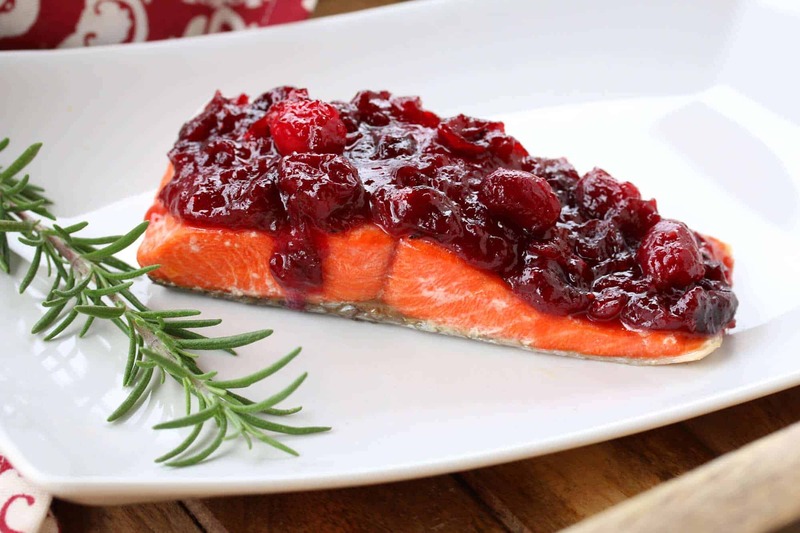 The salmon with the cranberry sauce looks delicious. A sous vide cooker has been on my wish list since I first learned about them. The salmon recipe looks beautiful and delicious and a definite must try! I don’t have a clue, but the recipe you posted is a good start. I need to add more as they are saying I have already wrote this, which I have not. I’ll make chicken. I plan on trying out new vegetarian casserole recipes in this wonderful slow cooker! Thank You & Hamilton Beach ever so much for a chance at winning. I have read many articles on sous vide cooking and I would love to experiment with this combination cooker. Steak first. I love how big this is! You can make anything in it! My family really enjoys eating fish, but I am terrible at judging when it is cooked properly. The Sous Vide/Slow Cooker by Hamilton Beach sounds like the perfect answer to my fish dilema. They are anxiously awaiting my attempt to recreate your salmon dish later this week. Everyone thinks the Cranberry Ginger Mustard Sauce will be the winner. The poor salmon is expected to come in second. I would love to put a sous vide to work, cooking chicken and fish! I have never used one, so I would have a ball looking up recipes to use. Thanks for the chance! I would use a sous vide for fish too, and chicken, and I would enjoy experimenting with different foods. I have slow cooker and also a Sous Vide and now wish i had known about the Hamilton Beach Slow Cooker/Sous Vide machine before i purchased them. What a space saver with it taking up half the room being two in one. Would definitely give away the others and use the Hamilton Beach. What a great idea. I plan to make chili in it. Looks yummy! I’ve been looking for new ways to cook salmon and that looks delicious! I love my sous vide! Perfect med rare steaks, moist turkey breast, never, never over cooked. I also use it to make perfect home made yogurt. This would be such a wonderful Christmas gift! And I LOVE that topping! WOW – that’s one mean machine!! What a fabulous addition this would be to any kitchen – I would love this in my kitchen!! I would use this machine daily! Chicken, turkey, pork, beef, veggies, whatever I can think of for good meals. I would use the sous vide cooker for perfectly cooked fish and beef fillet, The slow cooker for soups and stews. I’m interested in seeing how it does with poultry! This HB Pro sous vide machine is going to take my kitchen to the next level, and open up a whole world of more deeply flavored and more precisely prepared recipes. Cannot wait to get started! 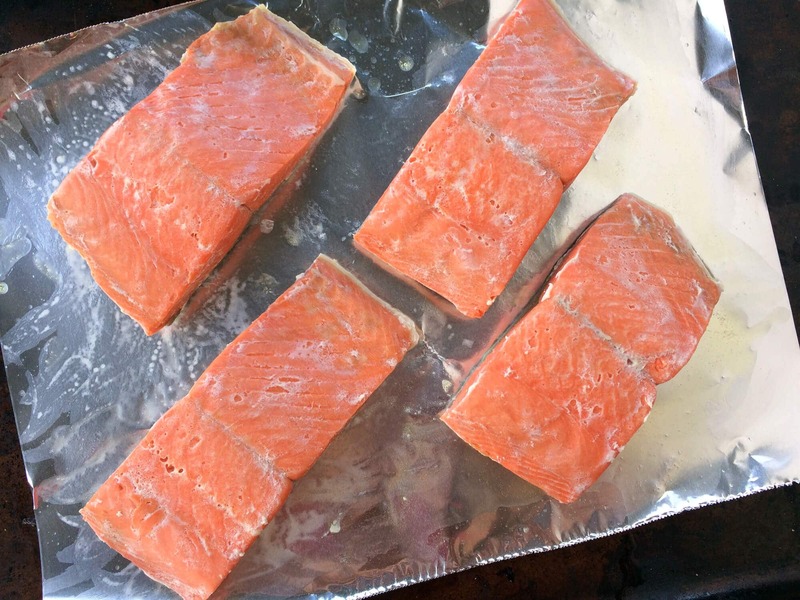 I would first try that salmon recipe in my new Hamilton Beach Sous Vide slow cooker! I would gift it to my aunt. 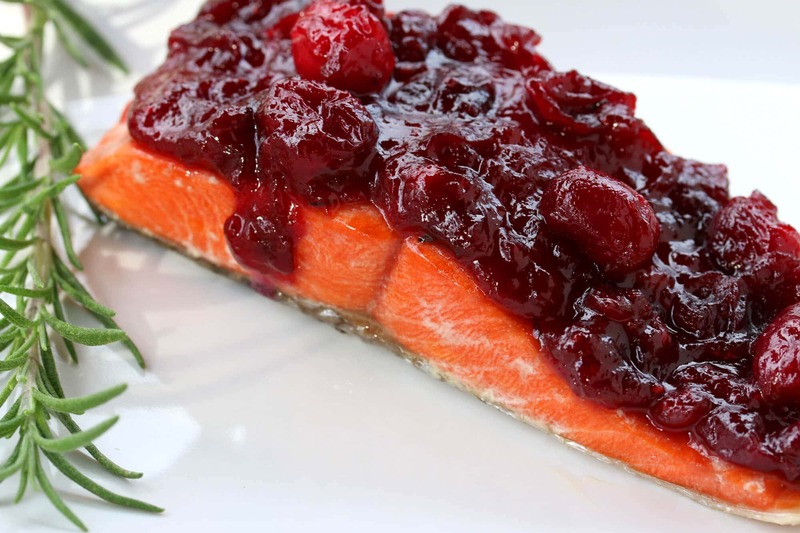 I’m looking forward to trying the salmon (with the cranberries) recipe first and then on to other foods. This appears to be a good addition for those of us doing AIP or Paleo batch cooking. Thanks for the ‘how-to’. My husband likes to joke that cranberries are his love language. He would love this recipe. As for myself, I would love to try the sous vide method to make a delicious steak dinner. ooo I just entered to win! I’ve always wanted to try a sous vide cooker! That salmon is perfect! I would use this appliance for many meals. I especially love that it also broils. it would be great to make my Taco Pie in and broil the top to brown the cheese. That looks so tasty! The sous vide cooker looks fantastic, too! 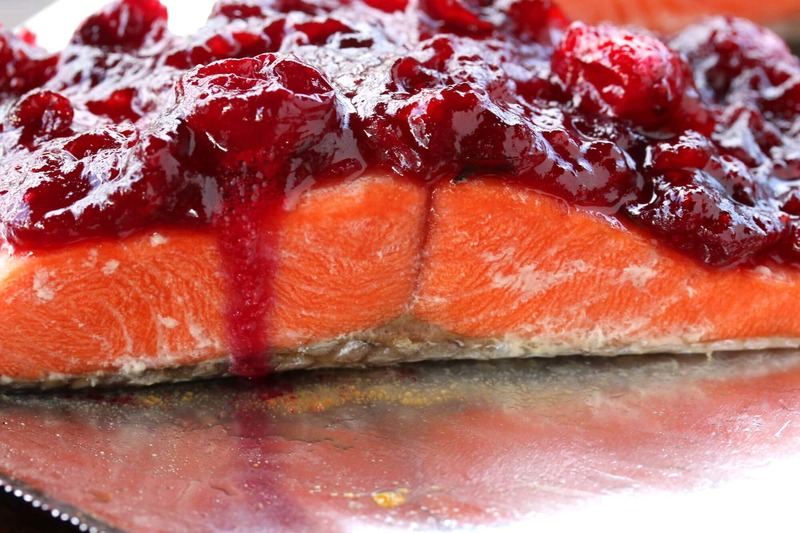 What an awesome way to cook salmon, and it’s so festive! I love salmon and I really like cranberries. 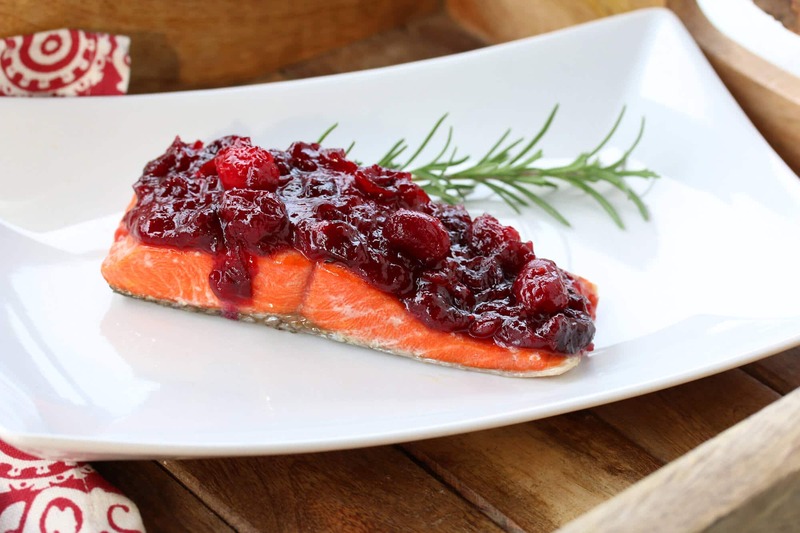 But to get the most out of the delicate flavour of this fish I would only use olive oil and lemon.to me, cranberries are overpowering and take away from the taste of fresh, locally caught salmon. I know, I know but I live in West Vancouver BC where we came catch or buy our salmon. I would make steaks and actually this recipe i would make. I LOVE salmon. I’ve never used a Sous Vide before so I’d have to look up recipes for doing that. I think the first recipe would have to be something with steak though. I’m planning on trying out some new sauces and jams using the sous vide slow cooker! Wasn’t at all familiar with that type of cooking, but I’m certainly curious now!. I’d have to search for some ideas though since fish is not my thing. What an awesome machine and that salmon looks delicious and so pretty! That bright color- I love it! That’s a hard question but I think I would first try out some chicken breast! 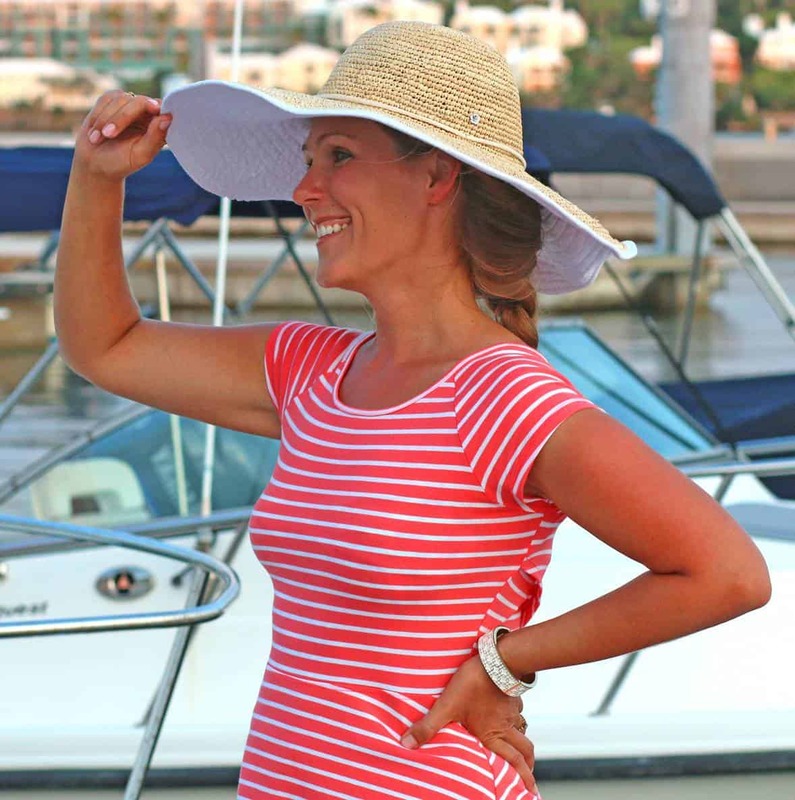 I have been looking for a great salmon recipe! Oh, wow, 15 kg cranberries!!!! The sauce on that salmon looks amazing, I’d love to try it! It’d be an entirely new frontier of cooking for me, but have heard wonderful things, especially for leaner proteins that can dry out in other methods of cooking. Would love to experiment! I have always wanted to try that type of cooking! Thank you for sharing this sauce recipe I think it would be nice to serve with pok, or poultry as well. I would love to try this! The colors are gorgeous! I’ve heard Sous vide chicken is amazing, so I would start with that! Soups are my favorite in a crockpot! I would have bought 15 bags of fresh cranberries at that price, too! Sous vide sounds like a fun cooking method. I would try beef stroganoff first. I plan to use my Sous Vide and Slow Cooker to make lemon chicken. 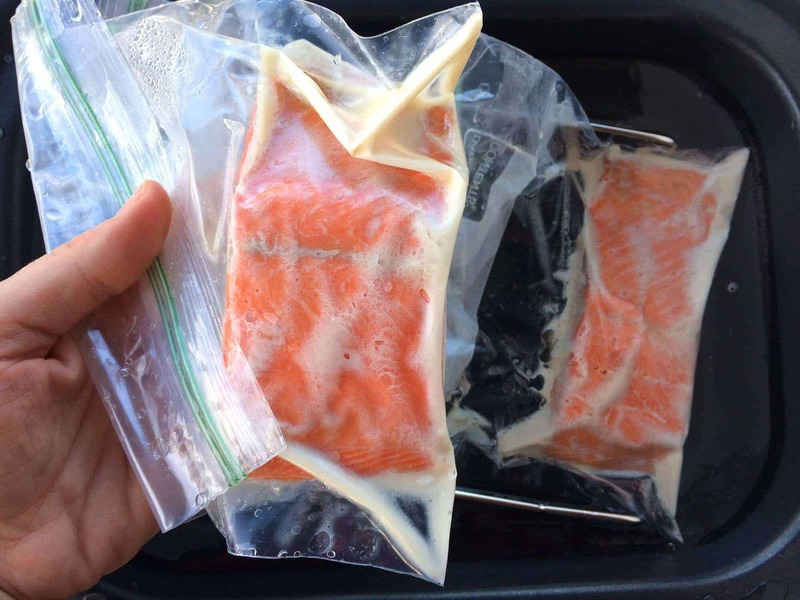 I’d use the sous vide process to cook fish and chicken breasts. I think it would keep them nice and moist. I would make curry chicken and anything else I could think of! I would use it at least 3 times a week for things like soups and roast and fish this is the coolest I have ever seen in my life to be able to do both in one! With the exception of a boil-in-bag frozen dinner that I tried in the 1980’s I’ve never attempted sous vide so that will be an exciting new food experience. I know the slow cooker would get lots of use. Two of my fav recipes are beef chilli and Mexican pulled pork. This looks real tasty and juicy. LOVE salmon! I wonder how it would work for a simple Oriental veggie dish over thin rice pasta – an all in one dish? This looks like the easiest entry to sous vide cooking. Some of the “cheffier” equipment seems ridiculously priced for the home cook. Plus, I could say sous vide frequently and raise my left eyebrow! I was going to use it to keep separate items warm; but scrolling down I saw the word curry. I love slow cookers, and a favorite recipe showcases mushrooms. But sous vide cooking sounds tres delicious, and I would love to experience this technique. This is an incredible machine and I would love to add it to my many other culinary wonders; I would probably use it for a swordfish dish. I love the versatility of the Hamilton Beach Sous Vide and Slow Cooker. If I win this machine, it’ll be nice for once to get home, whether at 9 pm or 11 pm, and have something hot and fresh to eat – like the tender, moist salmon above! I plan to use the sous vide for everything I can. I’d love to make chili using the slow cooker feature and experiment with chicken using the Sous Vide method. The salmon recipe sounds delicious! I’d definitely make that as well as chili, soups, curries, … basically whatever I can think of. I’ve never had a slow cooker (or sous vide), but I’ve always wanted to cook in both. A friend gave me an oxtail and lamb shepherd’s pie recipe that I’ve always wanted to try but have never been able to because it requires sous vide of the meats. Regardless, I just wanted to let you know that I discovered your site today (through a Google search for marzipan–it’s almost cookie time!!! ), and it’s my new favourite cooking site. Thank you ever so much for all your hard work. My family will be enjoying it for years to come. Cheers and Happy Christmas to you! Thank you, Ailis, and I’m so thrilled you found our site – Happy Christmas! Thank you, Selina, I’m glad you enjoyed it!